“How do you recognize your soulmate? In glittery 1980’s Los Angeles, Beau Kellogg is a brilliant Broadway lyricist now writing advertising jingles and yearning for one more hit to compensate for his miserable marriage and disappointing life. Amanda Harary, a young singer out of synch with her contemporaries, works at a small New York hotel, while she dreams of singing on Broadway. When they meet late at night over the hotel switchboard, what begins will bring them each unexpected success, untold joy, and piercing heartache ... until they learn that some connections, however improbable, are meant to last forever. STEALING FIRE was a Quarter-Finalist (Top 5%) in the 2012 Amazon Breakthrough Novel Award Contest. Six-year-old Amanda wandered over to the table and picked up the album cover. The name of the show, The Life and Times, was printed in bold letters across the top, with a pencil sketch of a black top hat and neatly folded white gloves in the middle. A splashy yellow sun, its rays streaming diagonally, filled the rest of the cover. She forgot about it, though, as the record began to play. “Again, Mommy, again!” she said excitedly when the first song ended. Amanda sat down on her favorite soft footstool near the big brown rocker and listened. She loved it all. Breaking dreams with every blow. She didn’t really understand the song, but it seemed sad to her. As with most show scores, Amanda asked to hear the record again and again. A few months later her older sister Josie, tossing a ball carelessly around the room, smashed the record. Amanda cried and asked her mother to please buy it again, please. Her mother explained regretfully that the show had been a `flop’ years before. There were no copies around, and Josie hadn’t meant to smash it; it was an accident. “Stop crying now, Amanda,” she said sharply. She listened to her mother and stopped crying. But she never forgot the song about bursting bubbles. The author will be awarding a notebook perfect for journaling to a randomly drawn commenter during the tour. That means the more you comment on the tour - the better your chances of winning! You can follow the tour HERE. 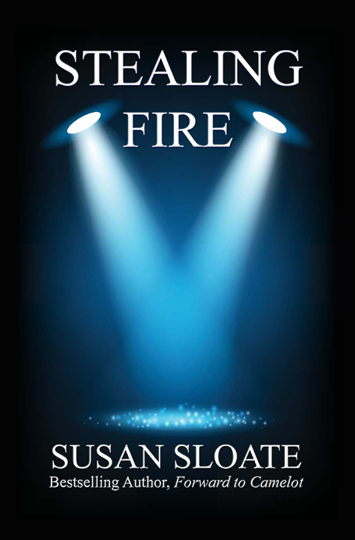 Susan Sloate is the author of 20 published books, including FORWARD TO CAMELOT (with Kevin Finn), an alternative history of the JFK assassination, STEALING FIRE, an autobiographical love story, and REALIZING YOU (with Ron Doades), for which she invented a new genre – the self-help novel. FORWARD TO CAMELOT was a #6 Amazon bestseller, took honors in 3 literary competitions and was optioned for film production by a Hollywood company. 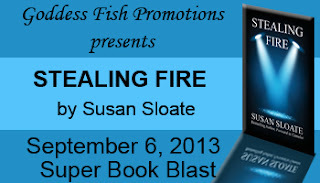 STEALING FIRE was a quarter-finalist in the 2012 Amazon Breakthrough Novel Award Contest. Susan has also written young-adult fiction and non-fiction, including RAY CHARLES: FIND ANOTHER WAY!, which won a silver medal in the 2007 Children’s Moonbeam Book Awards, AMELIA EARHART: CHALLENGING THE SKIES, a perennial Amazon bestseller, and MYSTERIES UNWRAPPED: THE SECRETS OF ALCATRAZ, which led to her appearance on a special for The History Channel in 2009, as well as books for five girls’ fiction series. As a screenwriter, she has written an informational film for McGraw-Hill Films and optioned two scripts to Hollywood production companies. 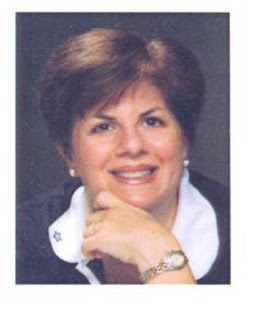 As a sportswriter, she’s covered the Los Angeles Dodgers, the Pittsburgh Pirates and the New York Mets. She’s also managed two recent political campaigns, founded the East Cooper Authors Festival (which put 18 professional authors in 17 area schools in one day) and serves on the Culture, Arts and Pride Commission of the Town of Mount Pleasant. Susan, I loved your book! Thank you, Krystal, for hosting me today. It's wonderful to be here! And Ms. Terrell, thanks for being my fan!